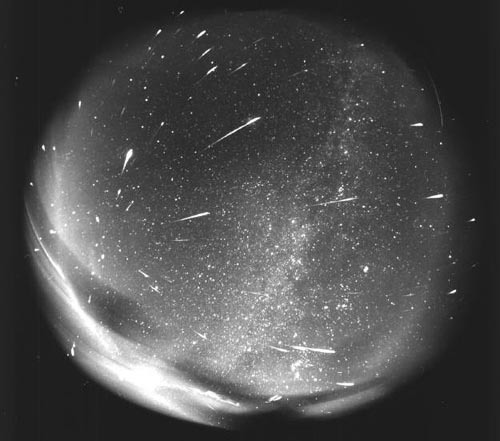 The peak of the 1998 Leonid meteor shower (rich in bright fireballs), shown in a four-hour time exposure through a fisheye lens, and taken by Juraj Toth of Modra Observatory. This photograph demonstrates how the meteors in a particular shower appear to emanate from a certain point in the sky called the radiant. On a given night, this radiant point will remain relatively stationary with respect to the background star constellations; but will rise, traverse the sky, and set in the same manner as the sun and moon. Since meteors are a transient phenomena one cannot go outside at night and expect to see meteor activity. This is especially true during the evening hours when the Earth is moving in the opposite direction from the sky seen above during those hours. At this time of night meteoroids (meteors in space) must catch up to the Earth in order to enter the Earth's atmosphere. Therefore meteor rates are lowest near 1800 (6:00pm) local time. Conditions for viewing meteor activity improves as the night progresses. At midnight a great majority of the meteors seen strike the Earth from a perpendicular angle instead of from behind. These conditions offer better rates than witnessed early in the evening but the general activity is still low when compared to the morning hours. During the dark morning hours the Earth is rotating toward the direction it moves in space, known as the apex. During this time the Earth slams head-on into meteoroids and many more will be seen. This is much like a vehicle driving through the rain. More raindrops will strike the front windshield compared to the rear window. The peak meteor activity occurs near 0600 local time. In addition to the diurnal cycle there are also annual variations in the meteor activity. As seen from the mid-northern hemisphere the second half of the year is much more active than the first six months. The reason for this are several. First of all the sporadic (random) meteor activity is stronger during this period. Also most of the major annual showers active during the second half of the year have radiants located north of the celestial equator, favoring northern observers. The cycle seen from the mid-southern hemisphere is opposite with the better activity occurring during the first half of the year. Observers at the equator enjoy fair, but not exceptional activity all year long. During certain times of the year the major meteor showers are active and increase the nightly activity severalfold. This is especially true if the moon is near its new phase and not brightening the nighttime sky. The list of these showers is provided below (see the class I showers). This is also the best time to see fireballs, which are exceptionally bright meteors that can light the nighttime scene. These meteors can range from the light of the brightest planet Venus (magnitude -5) to that beyond the light produced by the full moon (magnitude >-13). This double bursting fireball was photographed at 23:45 Universal Time on August 6, 2007 by Maurizio Eltri from central Venice, Italy. He estimated this sporadic (random) fireball to be of maximum magnitude -8, which is nearly as bright as the half moon. Picture courtesy of Maurizio Eltri, (Unione Astrofili Italiani Sezione Meteore). To keep current on the upcoming meteor activity the Meteors Section invites you to subscribe to their quarterly newsletter, available for the price of postage (currently 49 cents per issue). To subscribe contact our section coordinator Robert Lunsford. The 2016 Meteor Shower List is now presented in four separate parts. The showers are broken down by intensity with major, minor, variable, and weak showers being separated into their own groups. The general public is encouraged to use the list of major showers as they are the most well known and provide the most activity on a year to year basis. The other showers rarely surpass ten meteors per hour at maximum and are difficult to observe by the general public. The meteor showers listed above are the easiest to observe and provide the most activity. Particular attention should be noted to the time and moonlight conditions. All these showers are best seen after midnight. Some are not even visible until after midnight. Showers that peak with the moon's age between 10 and 20 days will be affected by moonlight and difficult to observe this year. While the time each shower is best seen remains much the same year after year, the moonlight conditions change considerably from one year to the next. We will post upcoming details of each major shower that is free from moonlight well in advance of their peak activity. The meteor showers listed above rarely produce an average of more than two shower members per hour. In some cases these showers have been recently discovered by video means, being too weak for visual observers to pick out from the sporadic background. This list is being provided for the experienced observer in order to verify the activity of these weak showers. Good luck with your observations in 2016! Shower: named for the constellation or closest star within a constellation where the radiant is located at maximum activity. Activity Period: the dates when the shower is active and the observer can expect activity from this source. S.L. : the equivalent solar longitude of the date of maximum activity. Solar longitude is measured in degrees (0-359) with 0 occurring at the exact moment of the spring equinox, 90 at the summer solstice, 180 at the autumnal equinox, and 270 at the winter solstice. Scientists use this time measurement as it is independent of the calendar. Radiant: the area in the sky where shower meteors seem to appear from. This position is given in right ascension (celestial longitude) and declination (celestial latitude). The radiant must be near or above the horizon in order to witness activity from a particular shower. Velocity: the velocity at which shower meteors strike the Earth's atmosphere. The velocity depends on the angle meteoroids (meteors in space) intersect the Earth. Meteoroids orbiting in the opposite direction of the Earth and striking the atmosphere head-on are much faster than those orbiting in the same direction as the Earth. This velocity is measured in kilometers per second. r: The Population Index, An estimate of the ratio of the number of meteors in subsequent magnitude classes. Simply stated: the lower the "r" value, the resulting overall mean magnitude of each shower will be brighter. "r" usually ranges from 2.0 (bright) to 3.5 (faint). ZHR: Zenith Hourly Rate, the average maximum number of shower meteors visible per hour if the radiant is located exactly overhead and the limiting magnitude equals +6.5 (A very dark sky). Actual counts rarely reach this figure as the zenith angle of the radiant is usually less and the limiting magnitude is usually lower. ZHR is a useful tool when comparing the actual observed rates between individual observers as it sets observing conditions for all to the same standards. Time: this is the time of night when meteors from each shower are best seen. Quite often the radiant will culminate after sunrise therefore the last dark hour before dawn will be listed. Daylight Saving Time (Summer Time) is used from March through October. These figures are also highly dependent on the latitude of the observer. The time listed is most precise for mid-northern latitudes. Moon: the age of the moon in days where 0 is new, 7 is first quarter, 14 is full, and 21 is last quarter. Meteor activity is best seen in the absence of moonlight so showers reaching maximum activity when the moon is less than 10 days old or more than 25 are much more favorably observed than those situated closer to the full moon. Class I: the strongest annual showers with ZHR's normally ten or better. Class II: reliable minor showers with ZHR's normally two or better. Class III: showers that do not provide annual activity. These showers are rarely active yet have the potential to produce a major display on occasion. Class IV: weak minor showers with ZHR's rarely exceeding two. The study of these showers is best left to experienced observers who use plotting and angular velocity estimates to determine shower association. Observers with less experience are urged to limit their shower associations to showers with a rating of I to III. These showers are also good targets for video and photographic work. Frequently Asked Questions about Meteors and Meteor Showers, a FAQ sheet containing more in-depth information on this topic. 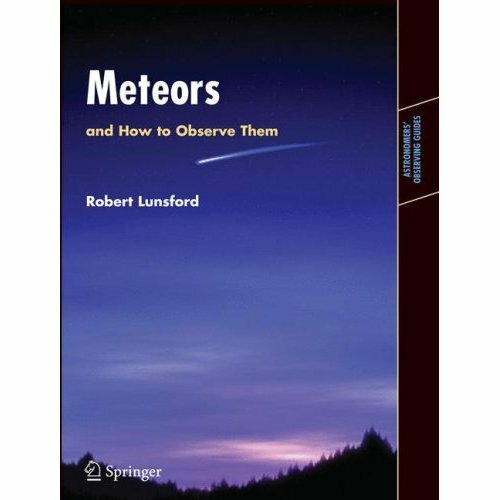 Robert Lunsford's Weekly Meteor Outlook, a weekly newsletter describing the meteor shower activity for a given week. Fireball Reporting Form, Report exceptionally bright meteors.